What do you think when you see a van or minivan at the gas pump? If you drive a motorcycle or a motorized scooter, you probably realize that you are lucky that you do not have to pay so much to fuel your vehicle. The Dodge Grand Caravan owner can feel the same way when she sees other van, truck and SUV owners filling up their vehicles. 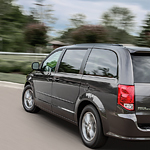 The fuel efficiency features of this minivan make it one of the highest fuel efficiency rated vehicles in its class. It gets nearly 30 miles per gallon on the highway. Filling up the minivan still costs more than filling up a vehicle that can only hold one gallon of gasoline in its tank, but some tradeoffs must be made for the ability to drive the car in the rain and fit the whole family. A larger gas tank is one of them.